Costa Rica held elections yesterday and the preliminary results are in. Because no candidate received more than 40% of the votes, there will be a runoff election to determine the country’s next president on April 6. Here’s a quick explanation of the background of the elections and the issues the country’s next president will face. Poverty in Costa Rica has been stuck around 20% for the last two decades (along with persistently high inequality) despite strong economic growth relative to the rest of the region. Poor infrastructure has long been a concern and the country has the fastest-growing public debt in the region, making spending on public works projects difficult. Moody’s recently issued a warning of a downgrade from the country’s current rating of Baa3, their lowest investment-grade rating. Chinchilla…leaves behind a fiscal deficit of 5.4 percent, public debt that tops 50 percent of gross domestic product, and a polarized society that has the unfortunate distinction of showing the greatest economic inequality in Latin America in 2013. Like its Central American neighbors, Costa Rica is also increasingly becoming a transshipment country for Andean cocaine destined for the US and other international markets. This has come with an increase in violent crime including a 71% jump in the homicide rate between 2005 and 2010. While the most important issues for voters in this election were economic (cost of living, inequality, and unemployment), crime and insecurity were close behind. Johnny Araya – Araya was predicted by many polls to be the top finisher, despite his association with the deeply unpopular Chinchilla’s National Liberation Party (PLN). While the party brands itself as center-left and social democratic, it’s members tend to fall on the rightward end of the political spectrum in Costa Rica. For example, former PLN president Oscar Arias pushed various neoliberal reforms during his time in office and his successor Chinchilla has opposed gay marriage, abortion, contraception and the separation of church and state. José María Villalta – Villalta, who also polled strongly before the election, is the only legislator currently representing the leftist Broad Front (FA) party. The lawyer and activist is the most left-leaning candidate, describing his campaign platform as “progressive, socialist, feminist, environmentalist, and pacifist.” He has proposed reforms to the public health and education systems as well as stronger workers’ rights protections, job creation initiatives, raising taxes on the wealthy, and expanding social programs. 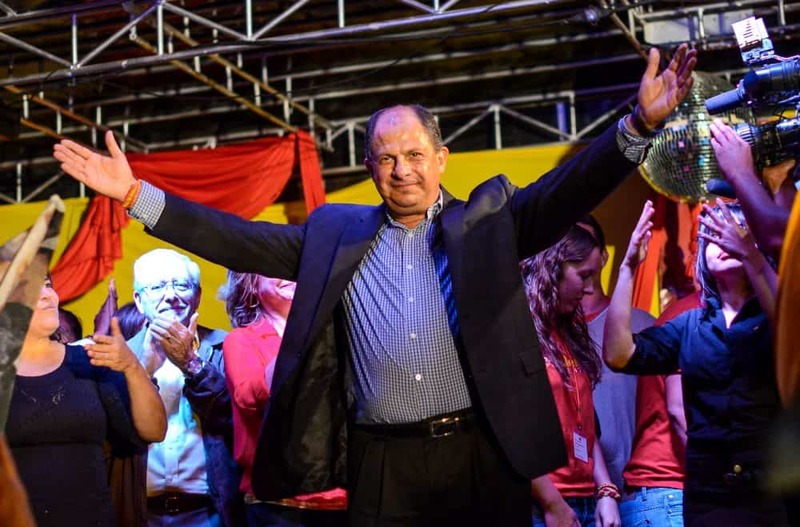 Luis Guillermo Solís – Solís is the presumptive winner of the first round of elections. Though most polls predicted a third- or fourth-place finish for him, the many undecided voters likely swung the race in his favor. A former member of Araya and Chinchilla’s PLN, Solis left the party for the left-of-center Citizen’s Action Party (PAC) in 2005, saying that the PLN had “lost its soul.” Solis has never held elected office, though he has been involved in government as an analyst and observer for many years as well as serving as Ambassador to Panama. However, his outsider status could have contributed to his strong showing in this election. Solis holds a slight lead over Araya (30.8% and 29.6% respectively; Villalta came in third place with 17.2%) , but since no candidate received the 40% necessary to avoid a run-off, the final round of elections will be held in April between Solis and Araya. While many Villalta voters are likely to cast ballots for Solis in the run-off, Araya polled strongly in the run-up to the first election and the second round will likely be closely contested. In that same interview, Solis connected the issue of the country’s underdeveloped infrastructure to the political establishment’s “liaisons with private monies” as well as corruption and lack of transparency. He also hit on other populist policies like a proposed pay freeze for top administration officials (including the president) and his party’s conviction “that fiscal policy is required to redistribute wealth.” He also proposed establishing a “banco de desarrollo” (development bank) to provide microloans to small and medium-sized entrepreneurs.